Cameron Highlands gets its name from William Cameron, a British surveyor who discovered the area on a mapping expedition in 1885. Despite he was the first to discover it, he forgot to mark it on the map so the area was only confirmed in later expeditions. It was not until Sir Hugh Low suggested that this would be an ideal location for a retreat and farmland that a passage was cut through the jungle. Because of its elevation, the British considered it a cool escape from the otherwise hot and humid Malaya and, in 1925, Sir George Maxwell decided to develop it as a hill station. Once the road was built, wealthy locals and British government officials started flocking in, building vacation homes on the slopes. Eventually, agriculture started to develop and in 1929, John Archibald Russell, the son of a British administrative officer, started a tea plantation called Boh Tea, an emblem of the area. When the Japanese troops retreated from Malaya in 1945, the British gradually returned to the highlands until the independence of Malaya from the British in 1957. Cameron Highlands is about 200km or 3,5h from Kuala Lumpur. The area can also be reached through a windy road about 2.5h from Ipoh, the closest airport. As we climbed the road to 1,500 meters above sea level, the fairytale mist covered most of the valley. 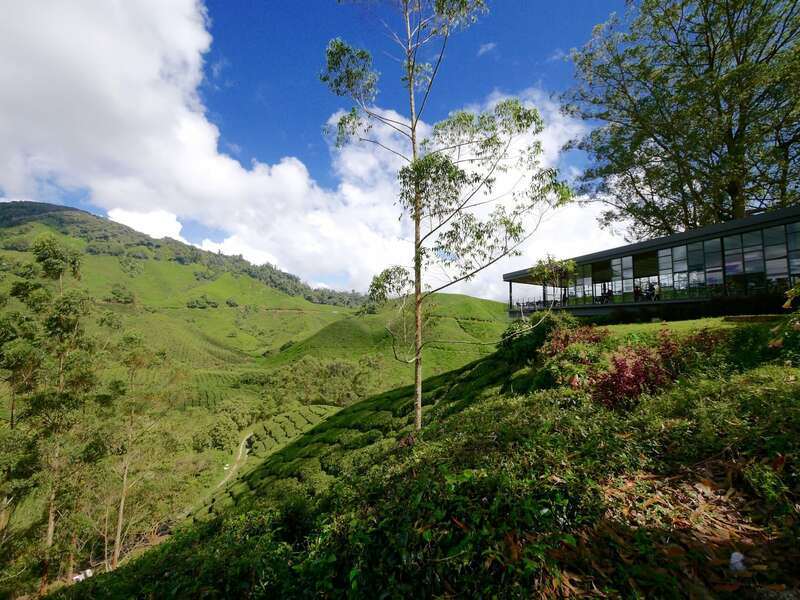 At the top, the tea plantations were visible, as was the thick jungle forests that the British explorers discovered. The jungle has been significantly destroyed in the last decade as a result of heavy development but can still be appreciated on nature treks. It was a crisp morning with bright sun rays and blue skies when we headed to Boh Plantation, the first tea plantation to open in Cameron Highlands over 80 years ago, and largest producer in Malaysia, with a yearly production of 4 million tea bags or 70% of the country’s total production. J.A. Russell, an established tin and rubber businessman in the early 1900s, realised that the demand for high quality tea remained high even during hard times so in 1929 founded Boh Tea Garden. 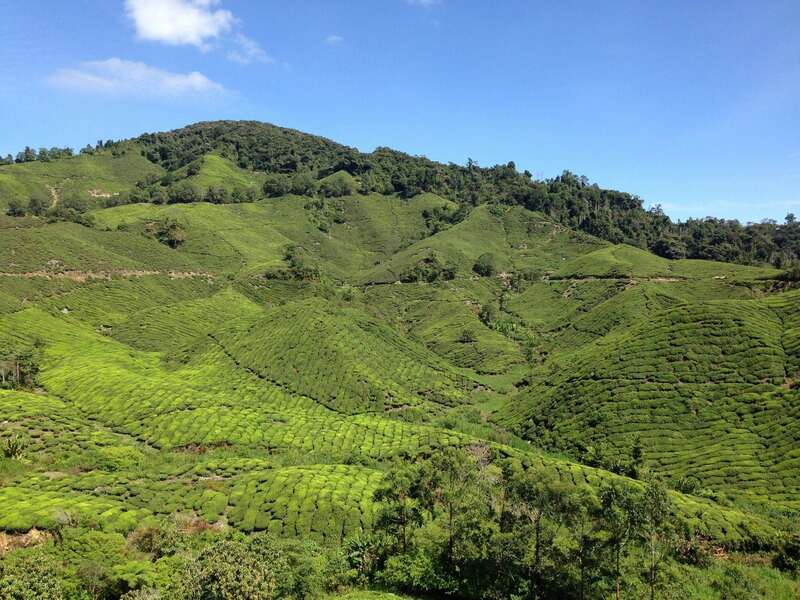 Since then, Cameron Highlands tea has been a staple in Malaysia’s tea offering. The main visitor center in Sungei Palas offers self-guided tours, with placards and information cards available to follow the evolution of the tea brand “with an umph!” along the years, or a guided tour of the factory at set times. On a Saturday morning, the area was packed with day visitors, mostly from Malaysia. The hanging cafe platform was a wow-inducing location for a 180 degree view of the plantations. Up in the hills, on the steep hill side, we could see the workers plucking tea leaves. 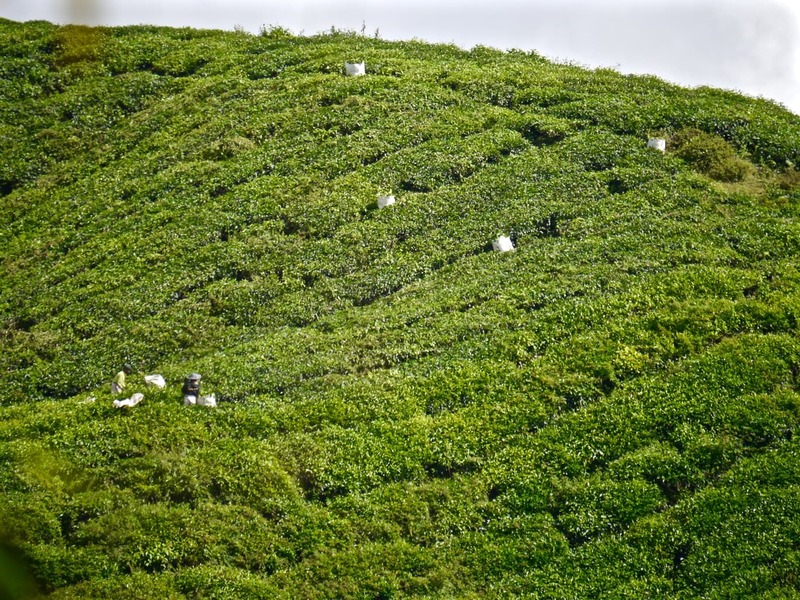 The undulating hills looked like a sea of tea bushes, waving to the wind. On a quieter day I would not have minded spending a morning enjoying a cup of Cameron Highlands tea a scone and some strawberry jam. But tea cannot be enjoyed without scones and jam and to make proper jam, one needs strawberries. “Pick your own strawberries”, I kept reading along the main road. Cameron Highland’s temperate climate is fabulous for this sweet delicious fruit to thrive and farmers realised it long ago. 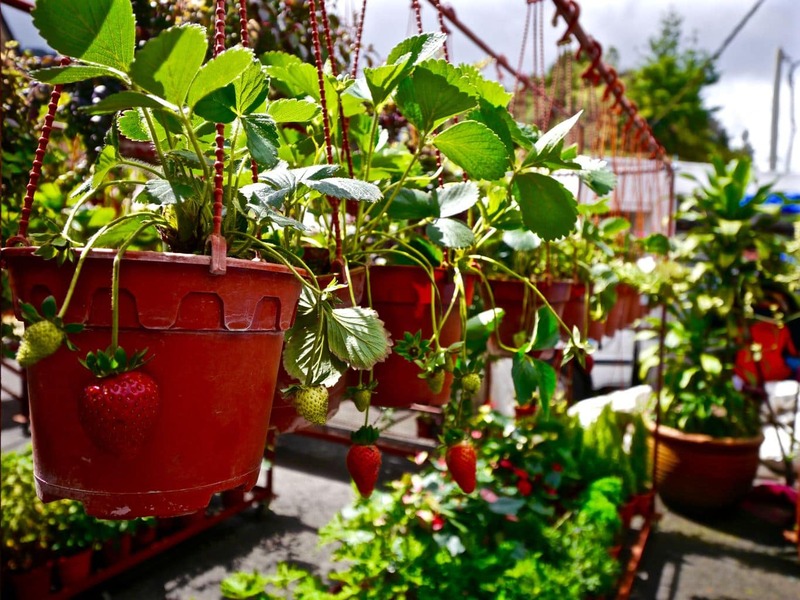 During the peak season, from May to August, visitors can not only enjoy a strawberry ice cream, jam, fruit salad and all the other variations created around the flavour, but also venture into the greenhouses and pick their own bounty. Lines and lines of strawberries hanged from perfectly stacked hydroponic racks ready to be picked. Who could say no? Strawberries need temperate climate and dry conditions so, in order to keep them from to much moist in the rainy highlands, they are all kept inside greenhouses. The area is covered in them and juicy fresh fruit and vegetables are grown inside, protected from the elements. It does make the area look like an awful plastic garden but it provide for the most incredible fruit. The strawberries we ate everywhere were decadently sweet and fresh. They melted in your mouth and I just could not get enough of them. I had them for breakfast, for lunch, in dessert format, as part of the afternoon high tea with cream, I even soaked myself in a strawberry bath at the Cameron Highlands Resort Spa. The expensive fruit that I fondly buy in Singapore but which tastes of nothing had a renewed flavor for the numbed palate. I just could not believe how beautifully they tasted compared to the ridiculously expensive, hard and flavorless boxes that I fill my fridge with. I was transported back to spring time back home when strawberries were in season. They were only available then, but they tasted glorious. 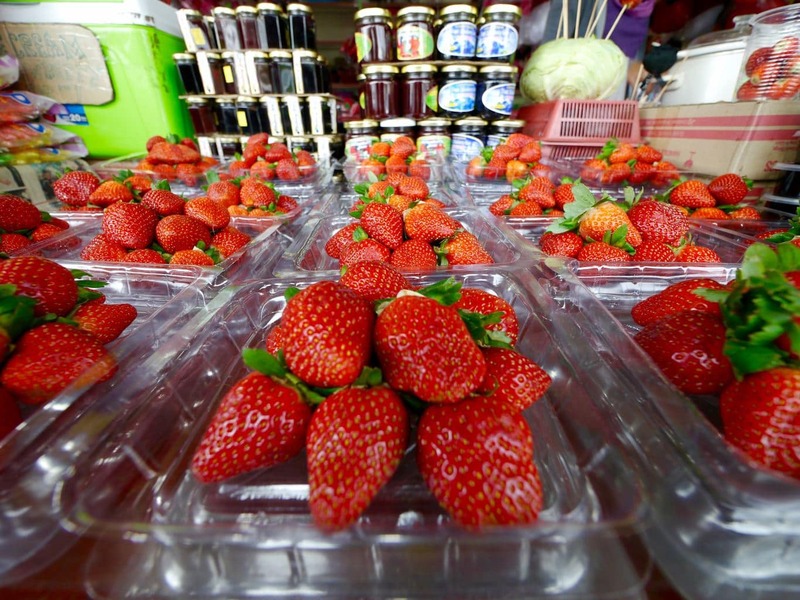 In Cameron Highlands, strawberries are a year-round delicacy, one worth the trip for. Cameron Highlands still maintains a sense of British Colonial appeal in the tea plantations, the cool damp climate and the afternoon high tea traditions. 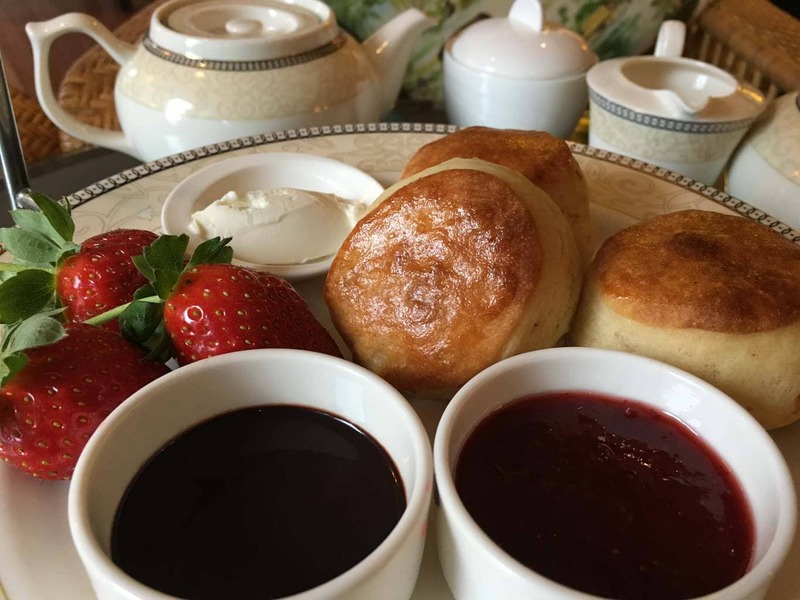 After picking strawberries and buying some tea, an Afternoon Cameron Highlands Tea was in order, complete with scones and strawberry jam, but also with cucumber finger sandwiches and layered trays. No better place for this than the piano lobby at the Cameron Highlands Resort. Slightly above the main road, overlooking the golf course, the large windows provided light even in the most British of weathers. I sat down in plush period armchairs to enjoy the pleasing atmosphere, the calmness and the swaying pine trees lined up by the resort’s entrance. Somehow, the wet and mossy weather started to have appeal with a hot cup of tea, scones, clotted cream and those fabulous strawberries. As I watched the fire place slowly burn, I forgot about the car noise, the traffic jams in the single lane road and the crowded markets selling plastic and plush strawberry toys. In the serenity of the Christmas tree, the velvet sofas and the flower fabrics I could only remember the endless green tea plantations extending as far as the eye could see and the bitter smell of the tea leaves being crushed. For a fun, tongue in cheek English take on afternoon tea, check out The Guardian rules on how to enjoy yours. Once in a Lifetime Journey was a guest of Cameron Highlands Resort. As always, all opinions are our own.